The Winthrop Rockefeller Foundation, in close collaboration with Arkansas Advocates for Children and Families, has launched the Arkansas Campaign for Grade-Level Reading (AR-GLR) to ensure that more of our low-income children succeed in school and graduate prepared for college, a career, and active citizenship. The Campaign focuses on one of the most important predictors of school success and high school graduation—grade-level reading by the end of third grade. 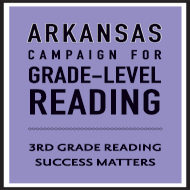 Our goal is that, by 2020, all Arkansas children will read at grade level by the end of third grade. ensure that all children, including and especially children from low-income families, have an equitable opportunity to meet those higher standards. Research recognizes that proficiency in reading by the end of third grade enables students to shift from learning to read to reading to learn, and to master the more complex subject matter they encounter in the fourth grade curriculum. Most students who fail to reach this critical milestone falter in the later grades and often drop out before earning a high school diploma. The Campaign is based on the belief that schools must be accountable for helping all children achieve. This means schools must provide effective teaching for all children in every classroom every day. But schools cannot succeed alone. Ensuring the academic success of children from low-income families will require a focus beyond school. It will require engaged communities mobilized to remove barriers, expand opportunities, and assist parents in fulfilling their roles and responsibilities to serve as full partners in the success of their children.